The new 2018 MacBook Air is essentially the 12-inch MacBook, made larger. 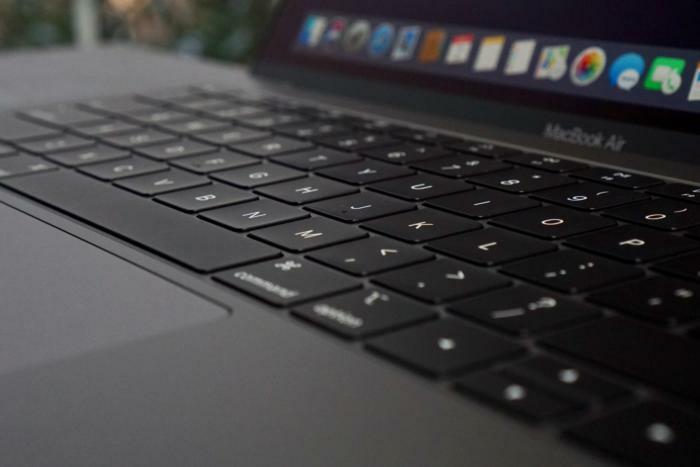 Apple says the MacBook Air is “the most beloved notebook ever,” and it’s not wrong. The huge success of the original Air had ripple effects throughout the industry, but it has languished in recent years. For the last three years or so, Apple had kept up with neither technological nor design advances in its most important laptop. 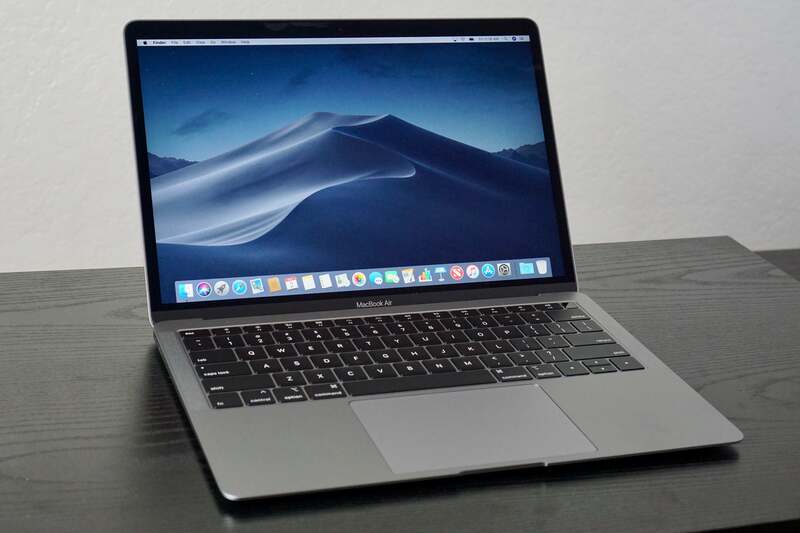 Now, the MacBook Air has finally been brought up to modern Mac laptop standards, skipping forward three generations of Intel processors, adding a Retina display and Thunderbolt 3 ports, and giving us three color options, among other things. But it feels a bit like Apple threw out the baby with the bathwater, jettisoning some features of the MacBook Air that make it so well-loved. In fact, it would be more accurate to call this a 13-inch MacBook than an all-new MacBook Air. Depending on how you look at it, this is either a great up-sized upgrade to the 12-inch MacBook, or a disappointing reinvention of the MacBook Air that throws out half of the things we really loved about it. The marquee feature of the new MacBook Air is its Retina display. It has a resolution of 2560x1600, giving it a pixel density of 227 pixels per inch—that’s the same pixel density as the 12-inch MacBook and the MacBook Pro, and four times the pixels of the old MacBook Air. It has a 48 percent broader color reproduction than the old MacBook Air, but it’s still limited to the SRGB color gamut, just like the 12-inch MacBook. The DCI-P3 color gamut is reserved for MacBook Pro displays and iMacs. Those wide, silver, 2010-era bezels around the display have shrunk buy half and are now black, with the glass going all the way out to the edge of the lid. It’s the look you know from every other Mac laptop, and while it’s not quite as edge-to-edge as the best non-Apple laptops, it’s a huge improvement. The new Retina display looks great, and the thinner, black bezels are a huge improvement. The slimmer bezels give the whole system a smaller footprint than the old Air. It’s almost exactly the same dimensions as a 13-inch MacBook Pro, in fact. The back edge is just a hair thicker than the MacBook Pro, but it tapers down toward the front in the familiar wedge-shaped fashion. This shaves off about a quarter pound of weight: it’s 2.75 pounds, instead of three pounds for the 13-inch MacBook Pro and old MacBook Air. The new MacBook Air (top) has almost the exact same dimensions as the 13-inch MacBook Pro (bottom), save for a tapered front edge. One of the things we loved about the MacBook Air was the MagSafe charging connector. USB-C charging is convenient in a “you only need one cord” sort of way, but there is almost no old-school Mac laptop user that doesn’t have a dozen stories about how the magnetic breakaway charger saved it from certain doom when someone tripped over the power cord. Apple is all-in on Thunderbolt 3 and USB-C now. The new MacBook Air has two 40 Gbps Thunderbolt 3 ports on the left side and a headphone jack on the right, and that’s all. Both USB-A ports are gone, as is the SD card reader. Two Thunderbolt 3 ports are better than one (on the 12-inch MacBook), but there’s no reason to ditch USB-A entirely. It’s easy to understand Apple’s intention to drag the world kicking and screaming into the USB-C era, but it feels premature, particularly on its least expensive mass-market laptop. All your thumb drives probably have USB-A connectors. Did your digital camera come with a USB-C cable? No? Neither did mine. From podcast microphones to game controllers, most everyday peripherals still expect a USB-A connector. It would be easier to forgive Apple’s USB-C zeal if it was consistent across all its products, but the iPad and all iPhones still come exclusively with USB-A cables in the box. Isn’t it odd that Apple sees value in a “legacy” connection like a headphone jack, but not in USB-A ports? The fact of the matter is, almost everyone who buys the new Air is going to have to shell out for at least one dongleRemove non-product link, if not more. 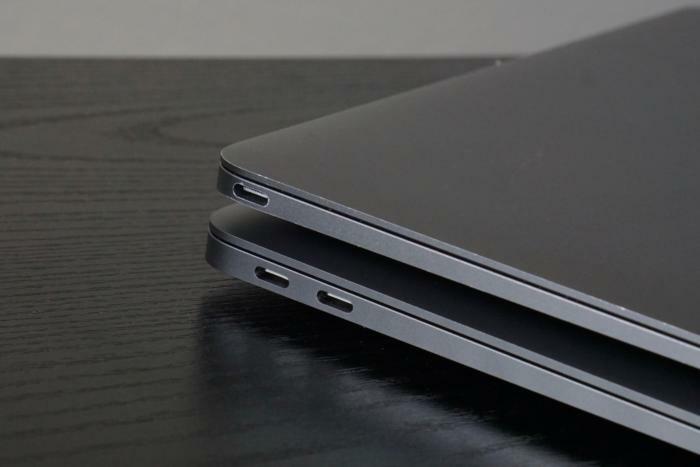 Would it have killed Apple to put a single USB-A port on the right side? Still, at least there are two Thunderbolt 3 ports rather than just the one on the 12-inch MacBook, so you can charge your laptop and still plug in other stuff. All other aspects of the MacBook Air have been brought into line with the rest of the modern Mac laptop line. 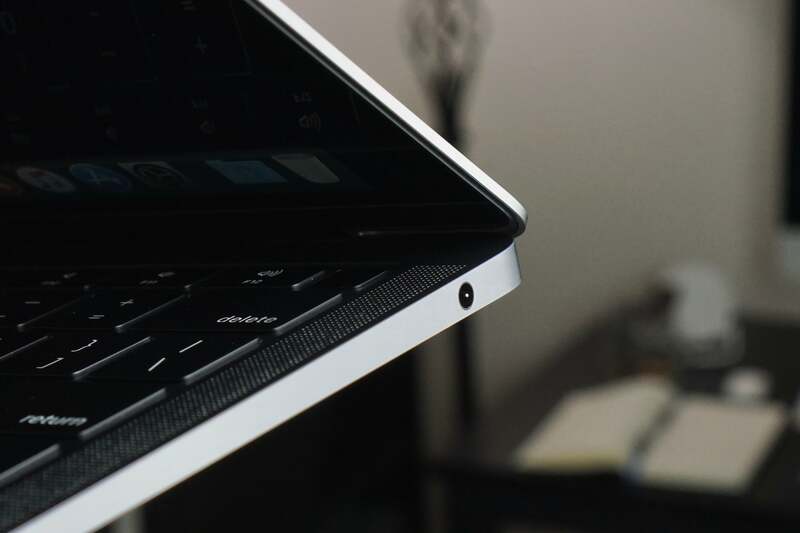 That means the old keyboard with its scissor-switch mechanism, universally hailed as one of the best on any laptop, has been jettisoned in favor of the ultra low-profile third-generation keyboard with its butterfly-switch mechanism. It’s the same one you’ll find in the new MacBook Pro, complete with the silicone membrane that helps keep dust out and makes typing a little quieter (it helps, but it’s still too loud). The new butterfly-switch keyboard, with its low travel and noisy clicking, is a downgrade from the old scissor-switch keyboard. Depending on who you ask, this is anything from a side-grade to a major downgrade. It’s worth nothing that it didn’t really allow Apple to make the laptop any slimmer; the old Air was only 7 hundredths of an inch thicker at the wide end but 5 hundredths of an inch thinner at the small end. Apple didn’t increase the size of the battery, either. The old Air had a 54 watt-hour battery, the new one is 50 watt-hours. There’s no Touch Bar on the new MacBook Air, but there is Touch ID. That means you have physical Function keys and a real ESC key, but can still use your fingerprint to log in, authorize purchases, and authorize password manager apps like 1Password. This is the best of all possible outcomes—the Touch Bar on the MacBook Pro is a failed experiment that adds significant cost, but until now it was paired exclusively with Touch ID. As much as I miss the superior and quieter typing action of the old Air’s keyboard, the fact that this is now the only keyboard with both Touch ID and physical Function and ESC keys makes it the best keyboard on any modern Mac laptop. I sincerely hope next year’s MacBook Pro models offer an option to have Touch ID without the Touch Bar. The addition of Touch ID means the addition of the T2 processor, as it is necessary to provide the secure enclave to store your fingerprint data. The T2 has lots of other benefits, too. It provides secure boot, handles disk encryption, processes audio, has an image signal processor for the FaceTime camera (which is a disappointing 720p resolution and still not very good in low light), even disconnects the microphone when the laptop’s lid is closed. The most recent MacBook Air refresh was in 2017 where the Core i5-5250U processor was ever-so-slightly upgraded to the Core i5-5350U (a Core i7 version was also available). That’s a processor introduced in 2015 with a 15-watt TDP (thermal design power). It’s a little embarrassing for a laptop that costs $999 to still use use such an old processor, and thankfully, the new MacBook Air has jumped up to a state-of-the-art model. It’s just not the one we wanted or expected. 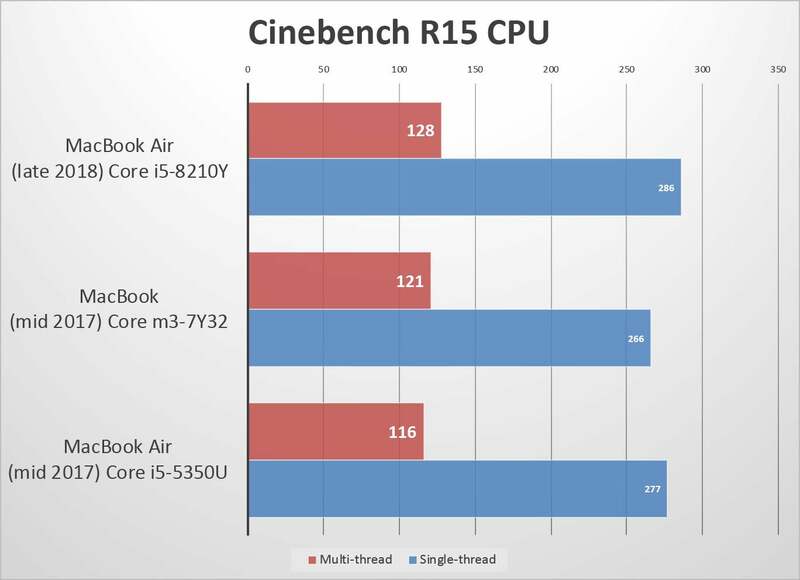 The CPU in the new Air is a Core i5-8210Y—still a two-core, four-thread processor, but with lower base clock speed (1.6GHz instead of 1.8GHz) and a higher boost clock speed (3.6GHz, up from 2.9GHz). There is no other processor option available. Those higher boost clocks help make the new CPU a little bit faster than the one in the old Air (jumping from a fifth-generation Intel processor to an eighth-generation one ought to do that). 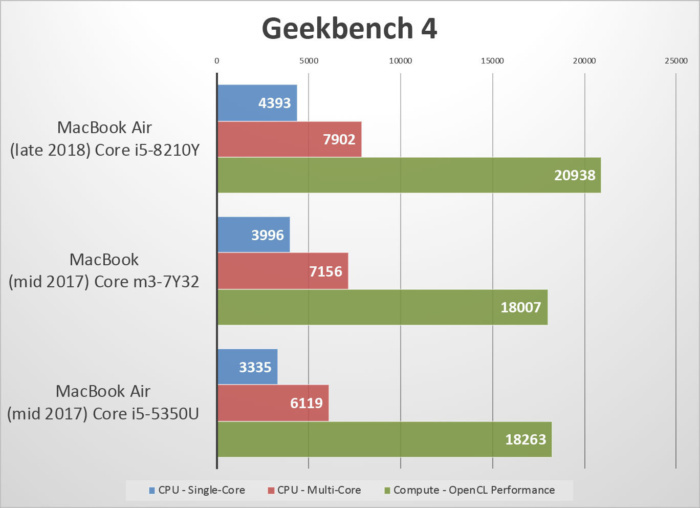 In Geekbench 4, the new CPU is about 30 percent faster than the one in the old Air, but only about 10 percent faster than last year’s 12-inch MacBook. 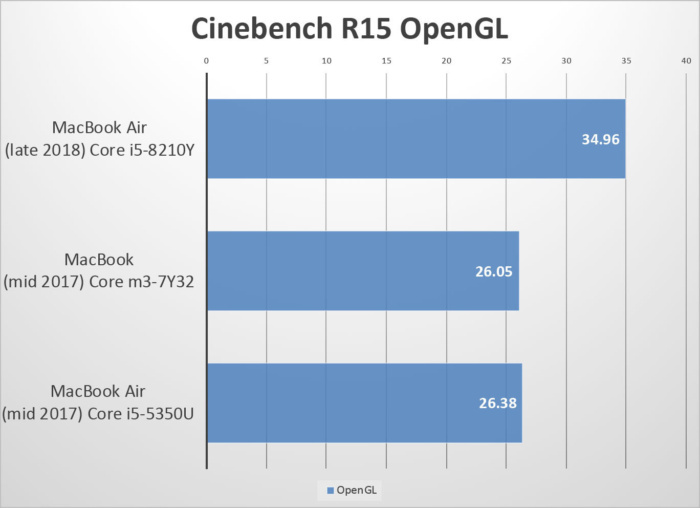 Cinebench’s CPU test shows far more modest CPU performance gains. This new CPU has a TDP of just 7 watts. Intel’s “Y” series processors are what it sometimes calls its Core-M series, and they are somewhat less capable than the “U” series processors in the old MacBook Air—base clock speeds, cache, and GPU performance is sacrificed to keep power consumption and thermals down. Core-M and Y-series processors are used in the 12-inch MacBook, for example. Graphics performance is up about 30% from the old Air and 12-inch MacBook. The new MacBook Air is essentially just as thick as before, so why is there a need to drop from 15-watt processors to a 7-watt one? A Core i5-8250U would give us double the cores and threads and 50 percent more cache. I can only assume it’s an issue of battery life. Despite being just as thick, the smaller footprint only leaves room for a 7 percent smaller battery, but the display on any laptop is a huge power draw. The new Retina display must use significantly more power, and the only way Apple could keep its promise of “all-day” battery life is to use a lower-power processor. For an idea of how much faster the Core i5-8250U would be in a similar-sized laptop, check out PCWorld’s review of the Dell XPS 13. Spoiler: The new Air would be twice as fast in multitasking operations with a 15-watt CPU, and the GPU would be a lot faster, too. I would gladly sacrifice an hour or two of battery life for a Core i5-8250U. Whatever the reason, Apple’s processor choice is a disappointment. The one and only CPU you can get in the new MacBook is only a little better than the Core-M you get in the 12-inch MacBook, and it’s a far cry from taking the aging 15-watt CPU in the old Air and replacing it with a modern 15-watt model. Fortunately, Apple didn’t skimp on storage performance. While the starting capacity of 128GB seems a little low, at least the SSD is blazing fast for a laptop of this size. A quick run of the BlackMagic disk speed test shows read speeds of about 2 gigabytes per second, and write speeds just under 1 gigabyte per second. The SSD is quite fast for such a thin-and-light laptop. Frankly, after looking at the performance of the A12 and A12X in the latest iPhones and iPad Pro, I’m ready for the eventual switch to Apple-designed processors in MacBooks. Being able to use your laptop—really use it—over an entire transcontinental flight is a key part of what made the MacBook Air famous. Happily, quadrupling the pixels in the display hasn’t killed that feature. Apple says you’ll get up to 12 hours of wireless web browsing (the same as the old Air) and up to 13 hours of movie playback (an hour more than the old Air). The new MacBook Air didn’t last as long as the 12-inch MacBook in our battery rundown test, but nearly 11 hours of HD movie playback is still quite fantastic. I looped a movie in iTunes with the brightness calibrated to 150 nits, and the new Air ran for and impressive 10 hours and 45 minutes. That’s an hour less than I got repeating the same test at the same brightness with a 2017 12-inch MacBook, but still quite fantastic for a high-res 13-inch laptop. I spent five hours working and browsing the web with the display brightness at about 70 percent and still had 50 percent charge remaining. 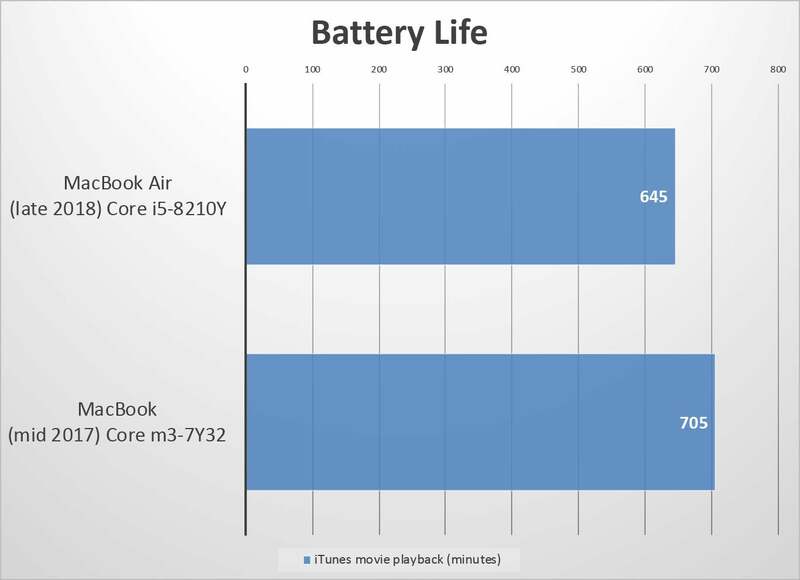 The MacBook Air is still a battery champ. 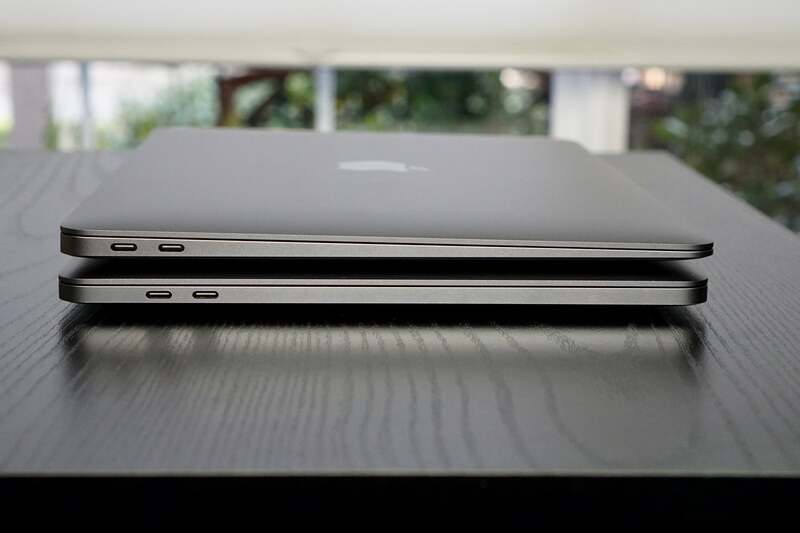 Is it a bigger MacBook, or a redesigned MacBook Air? There are two ways to look at the new MacBook Air. Apple pitches it as a ground-up redesign of its most beloved laptop, and by that measure it’s a little disappointing. It’s slightly more compact and a little bit lighter, and it has Touch ID, Thunderbolt 3, a better trackpad, and better speakers. And of course, it has a Retina display. In all those ways, it is better than the old MacBook Air. But it has also taken away the best keyboard ever on a laptop and replaced it with a noisy and uncomfortable short-throw keyboard that nobody seems to really love. It’s dropped USB-A entirely, so you’re going to have to buy dongles and new cables to use all your accessories. The SD card slot is gone, which will annoy photographers. MagSafe is gone, so now you have to use up one of your two USB-C ports to charge up. It’s not much faster, either—not nearly as much as it could be if Apple didn’t drop from 15-watt processors in the old MacBook Air to a 7-watt processor in the new one. And it’s quite a bit more expensive, too. The old Air started at $999 for a system with 8GB of RAM and 128GB of storage, and let’s face it, over time it became overpriced for what you got. The new Air starts at $1,199 for the same RAM and storage (and you’ll definitely want to spring for the 256GB storage upgrade, brining the price to $1,399). Retina and Touch ID are wonderful additions, but everything else seems like it’s just playing catch-up on a product that had fallen way behind the times despite holding on to its thousand-dollar price tag. On the other hand, you could look at this as a 13-inch variant of the MacBook; larger and a little bit faster, with a second ThunderBolt 3 port, Touch ID, and better speakers. The 12-inch MacBook starts at $1,299 with a 256GB SSD, making the entry-level price of this bigger and better version $100 cheaper, or the price with the same amount of storage $100 more. That’s a perfectly reasonable price for this upgrade. 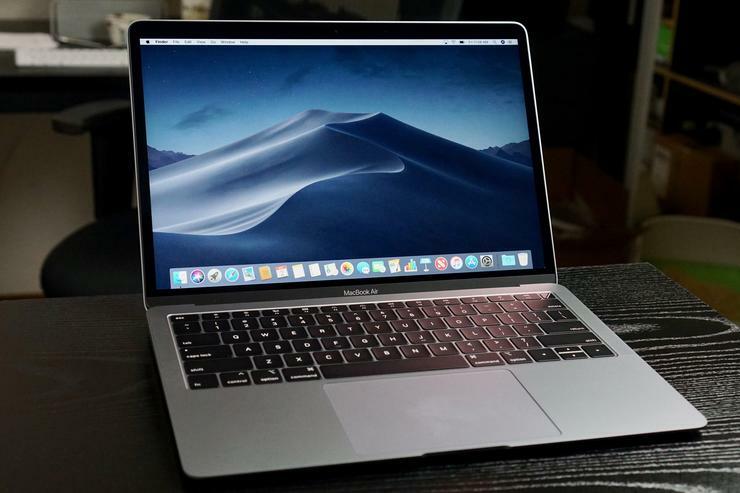 If you’re familiar with the 12-inch MacBook, using the new MacBook Air makes it immediately obvious that this is a slightly updated and scaled-up version of that model, with the “Air” name attached. If you’ve been waiting for years for Apple to finally re-imagine the MacBook Air in a way that will once again revolutionize the thin-and-light laptop market, you’re going to be disappointed to find that it has only been brought up to the standards of other modern Mac laptops, with all the good and bad that goes with that.